SKU: 9781782550679. Category: Education. Tags: College Majors, Select College Major. Choose Your College Major in A Day will help you determine your personality type by administering an assessment that identifies majors for each type of personality. Included in this book is a checklist of skills to help you understand your strengths and a checklist of common high school courses to identify your favorites. It helps you locate the majors that dominate the list by asking you to make a top five list. Each major is defined with a description how it relates to high school courses, specializations, a list of common course requirements, a typical career path, a list of related occupations, personality type skill, and economic information for related occupations. 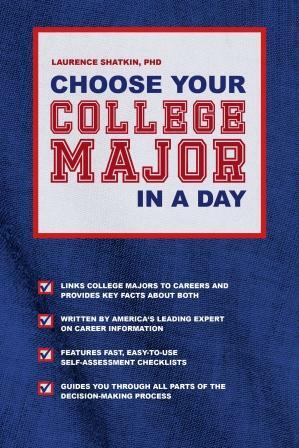 In conclusion, the book leads you through an exercise of weighing the pluses and minuses of majors, especially those on the top 5 list and asks for a tentative choice. “Dr. Shatkin, scholar and author, is a heavyweight in the career information field.” ~ Joyce Lain Kennedy, nationally syndicated career columnist. Laurence Shatkin Over the past 35 years, Dr. Shatkin has established a reputation as one of the nation’s leading career information experts. He appears regularly on national news programs and in major print publications to share his expertise about trends in the world of work. He also presents regularly at career development conferences. In addition to writing books, he has been an award-winning career information systems developer. He lives in Titusville, New Jersey. – Over the past 35 years, Dr. Shatkin has established a reputation as one of the nation’s leading career information experts. He appears regularly on national news programs and in major print publications to share his expertise about trends in the world of work. He also presents regularly at career development conferences. In addition to writing books, he has been an award-winning career information systems developer. He lives in Titusville, New Jersey.